Oncologic, cardiovascular, and neurological diseases are the most common causes of death in the developed world. It is well established, especially for cancer that early diagnosis results in more favorable outcomes. Although various diagnostic tests are available imaging tests remain an important part of the diagnostic arsenal. Whereas blood tests can inform of the presence of a disease, imaging procedures allow for locating and visualizing the diseased areas. In addition, these imaging procedures can allow for monitoring treatment response. Fig. 1. Main properties of nanoparticles that affect performance of imaging agents. Radiographic angiography, magnetic resonance imaging (MRI), positron emission tomography (PET), and ultrasound are common procedures used in the diagnosis of cardiovascular events and are mainstays in the cancer-imaging realm as well. The selection of an appropriate imaging modality requires evaluation of factors such as spatial resolution, sensitivity, temporal resolution, and tissue type and depth. When these imaging modalities are used in conjunction, a more thorough understanding of the disease can be attained. The different imaging modalities are not highly sensitive when used alone for most purposes. Therefore, it may be necessary to administer a contrast agent that increases sensitivity of the procedure. The majority of contrast agents are small molecules or chelates. However, these small molecule contrast agents do not accumulate in optimal concentrations at disease sites because they usually have short half-lives and in most cases are not targeted to a site of the disease. They also are renally excreted and may cause toxicity concerns in patients with renal dysfunction. Nanoparticles represent the next generation of imaging agents. The composition dictates which imaging modalities can be exploited. For more rapid clinical translation, it is ideal to design nanoparticles for clinically utilized modalities. 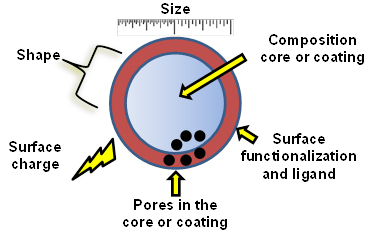 Because of the tunable characteristic such as size, shape, surface functionalization, and composition, nanoparticles can be designed to fit the imaging purpose (Fig. 1). In addition, imaging nanoparticles can be targeted to the site of a disease (Fig. 2). In case of cancer, nanoparticle-bound imaging dyes can detect not only primary tumors but also spread metastases. They likewise can improve a pharmacokinetics of the encapsulated agent, limit its toxicity and allow the contrast substance to penetrate into a diseased organ, tissue or cell. Disturbance of normal apoptosis plays a central role in many diseases. Apoptosis is classically known as programmed cell death. The significance of apoptosis ranges from normal cell turnover in homeostasis to pathogenic cell death. Proliferative tissues undergo apoptosis to renew and maintain proper functioning. Whereas it is a driver of pathogenesis in ischemic cardiovascular injuries and neuronal loss, the lack of apoptosis seen in cancer, many chemotherapeutic agents as well as radiation and photothermal therapy are designed to induce iatrogenic apoptosis. Fig. 2. Cancer-targeted nanoparticle-based imaging system. Apoptosis is one of the most well studied cellular processes and there are numerous in vitro assays for the detection for apoptosis using gel electrophoresis, flow cytometry, and microscopy. However, the clinical usefulness of these assays is limited not only by their in vitro or ex vivo nature, but their inability for real time monitoring. Because of its role in many processes and therapeutics, research in developing an in vivo apoptosis imaging agent is gaining interest as a diagnostic and prognostic tool. In vivo, real time detection of apoptosis can greatly benefit patients by early diagnosis or monitoring the effectiveness of therapy. The customization and multi-functionality of nanoparticles will allow them to accumulate in target tissues and selectively differentiate between healthy and apoptotic cells. Nanoparticle design considerations for molecular imaging of apoptosis: Diagnostic, prognostic, and therapeutic value.